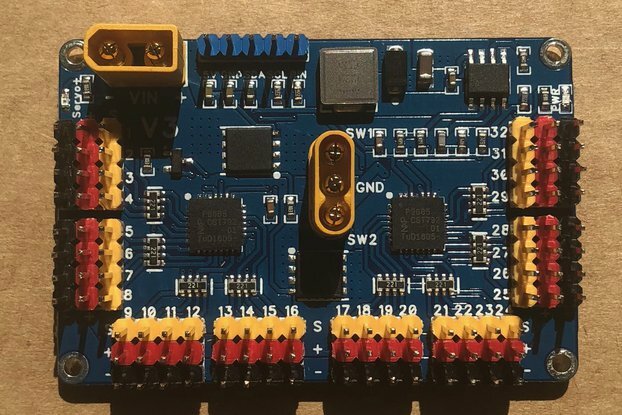 This power board can be programed as an Arduino & is ready for 16 optically isolated FETs: all N, all P, or half N & P-ch for an 8x8 matrix. 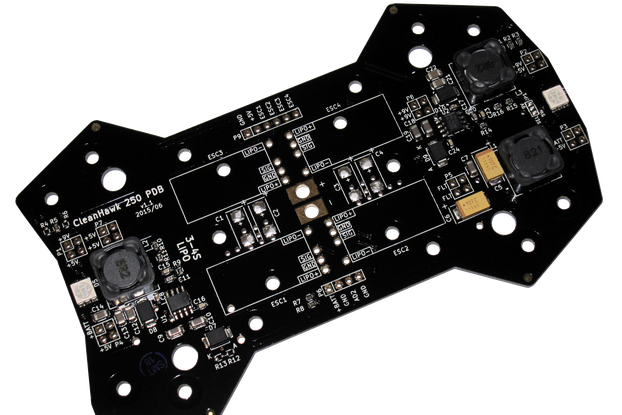 The Protean 8x2 is an Arduino compatible development board with power control in mind. 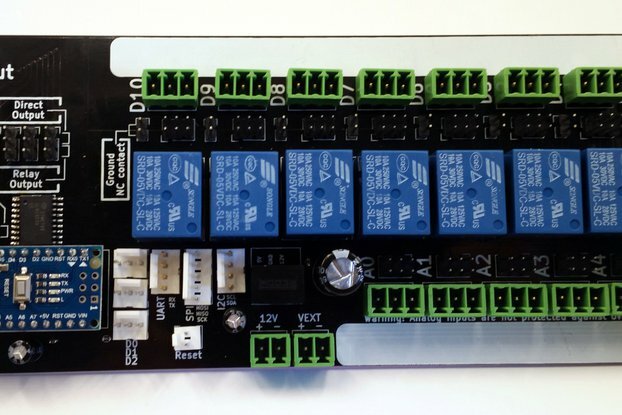 It gives you the freedom to use the FETs, (essentially DC power switches), and connectors you want. You can determine the full turn-on voltage most efficient for your FETs, (the Vgs), without hunting for “logic-level” FETs. Because it has a place for optocouplers to provide electrical isolation, you don’t need to worry that it will fry the ATmega328P micro-controller. Easy to follow wiring guides are also now available. 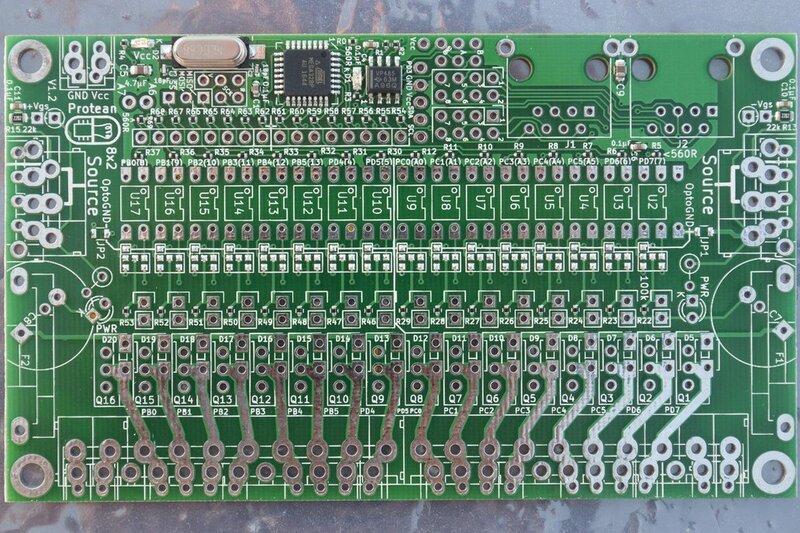 These boards are being sold nearly at cost since the Kickstarter was not funded. I love the idea of node based controllers seen in modern pinball machines, but nearly all of them are proprietary and virtually undocumented! The hardware available for custom machines run about ~$100+ per board, are generally large (~20 sq in./~130 sq cm), require a separate main controller, and have a fixed serial protocol and rate. 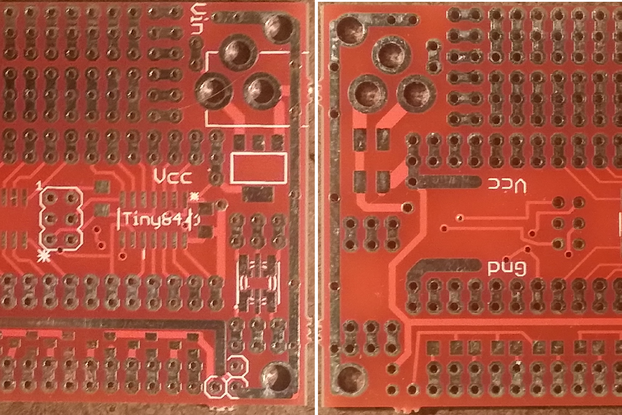 Other boards were understandably meant for use in existing, typically older machines, and were more expensive. From the “build your own” perspective, there were numerous Audrino FET shields to chose form, (and relay boards), but all with different specs, hardware interfaces/terminals, and limited FETs. Of course they also required a separate Arduino or controller board. Many people just use an Arduino Mega and run wires to multiple different modules and components. The same could be done with the awesome Teensy 3.5/3.6, (an ideal main controller for pinball in my opinion). But the otherwise tedious point-to-point or expanded board-to-board method didn’t seem very appealing, easily scalable, or space conscious. There’s already enough unavoidable connections to be made. 16 optically isolated channels (main I/Os). Power traces bare, allowing for added solder to increase current handling. LED on port D3, (or digital pin 3). No connectors, fuse holders, optocouplers, or FETs are included since these things are dependent on your application. WARNING: This product can expose you to chemicals including lead, which is known to the State of California to cause cancer, birth defects, or other reproductive harm. For more information, go to www.P65Warnings.ca.gov.